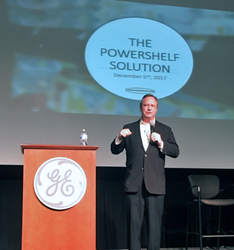 John White, Co-CEO of Powershelf and Compass Digital, spoke about the importance of digital transformation in the consumer packaged goods industry at the Technology Immersion and Benchmarking Summit in Greenville, South Carolina. Powershelf provides Internet of Things (IoT) solutions to chain retailers and consumer packaged goods companies. The Powershelf platform enables retailers to transform their stores into smart, connected environments. The platform collects on-shelf data which can be used to realize greater operational efficiencies, reduce out-of-stock incidences, improve demand forecasting, reduce waste, and, ultimately, offer shoppers lower prices and more personalized promotions. The Technology Immersion and Benchmarking Summit was sponsored by GE Digital and The Association for Packaging and Processing Technologies (PMMI). Operations, IT and engineering leaders from the consumer packaged goods and equipment manufacturing industries attended the conference to learn about the power of digital technology and its potential to disrupt their industries. Other key speakers included representatives of Intel, Hewlett-Packard Enterprise and GE. The conference was held at the GE Power manufacturing facility in Greenville, South Carolina on December 5 and 6. More information about the conference is available at https://ge.cvent.com/c/express/cbd28b9a-dffd-4a32-b681-135e64157c76. PMMI, The Association for Packaging and Processing Technologies, represents the voice of more than 800 North American manufacturers and suppliers of equipment, components and materials as well as providers of related equipment and services to the packaging and processing industry. We work to advance a variety of industries by connecting consumer goods companies with manufacturing solutions through the world-class PACK EXPO portfolio of trade shows, leading trade media and a wide range of resources to empower our members. The PACK EXPO trade shows unite the world of processing and packaging to advance the industries they serve: PACK EXPO International, PACK EXPO Las Vegas, Healthcare Packaging EXPO, PACK EXPO East, EXPO PACK México, EXPO PACK Guadalajara and ProFood Tech. PMMI Media Group connects manufacturers to the latest solutions, trends and innovations in processing and packaging year-round through brands including Packaging World, Automation World, Healthcare Packaging, Contract Packaging, ProFood World and Packaging + Processing OEM. PMMI Business Drivers assist members in pursuing operational excellence through workforce development initiatives, deliver actionable business intelligence on economic, market and industry trends to support members' growth strategies, and actively connect the supply chain throughout the year. Powershelf is a leading provider of retail technology solutions. The patented technology—the Powershelf system—provides constant power and two-way communications to software-enabled applications and devices that deliver a variety of advertising, merchandising and inventory services to suppliers, distributors, stores and shoppers. Powershelf is designed to address the critical, ongoing challenges faced by retailers and CPG manufacturers around the world, in order to lower global food prices. Visit http://iotsmartretail.com for more information.